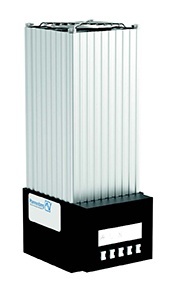 Pfannenberg PRH-M Mini Radiant Heaters (10 to 30 Watts) are ideal for smaller enclosures or for the heating of isolated spots in sensitive areas. These heaters use natural convection to heat the cabinet and prevent condensate formation. FLH series of Radiant Heaters (up to 150 Watts) are used in combination with a thermostat or hygrostat, mainly to avoid excessively low temperatures or high humidity into the enclosure. Pfannenberg FLH series of Fan Heaters (250 to 400 Watts) have an integrated fan that assists the natural convection and provides fast distribution of the heat in the electrical enclosure. The fan heaters are used in combination with a thermostat or hygrostat, and are designed to protect electronics from moisture or corrosion caused by high humidity, low temperatures or condensation caused by rapid temperature change. Need more than "just" a Heater? Pfannenberg also offers a range of fan heaters with an integrated thermostat: PFH-T (200 - 1200 Watts) dedicated to larger enclosures and with flexible mounting options. These fan heaters with adjustable thermostat are especially designed to protect electronics from the effects of low temperatures such as corrosion, freezing or condensation, which can damage critical components within a control enclosure. Reduced energy consumption and optimization of the efficiency of the heaters. Additional savings on energy, materials and time. Pfannenberg’s heaters, thermostats and hygrostats detect and keep ambient conditions above dew point to avoid the harmful effects of condensation on your electronics. 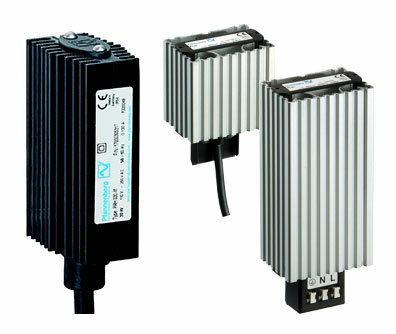 They can be used as a standalone product or in partnership with our Filterfan® and Cooling Unit product lines for a complete Thermal Management of your electrical enclosures.